I grew up loving Care Bears, so it excites me when new Care Bear DVDs are released so that my daughter can grow up with them too! Lionsgate is releasing a brand new dvd entitled "Helping Hearts" that includes 8 never before seen episodes, which include: Ice Creamed, A Little Help, Unbearable, Twinklet, Rainshine Meadows, Care-ful Bear, Rudemate and Dare Bears. What I love about the new Care Bears is that they teach lessons with each different episode. For instance, they teach about friendship, teamwork, honesty and all the things that I want my daughter to know about. (This DVD focuses on helping others.) But, as a parent, you realize that just telling your children sometimes isn't as effective as having it played out by their favorite cartoon characters! I was especially excited about teaching about helping others, because we are working with our daughter on her empathy and realization that the world does not revolve around her- something most four year old's don't understand. So, I love that that was one of the themes in this DVD! Family Time Factor: I think this is something kids ten and under could enjoy. If they watch Saturday morning cartoons, they probably won't mind it. And of course, toddlers eat it up! Plus, it's not hard for me to watch with them. 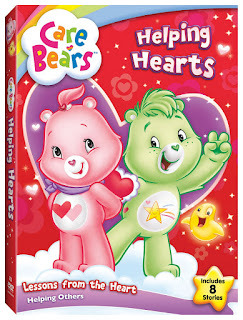 Care Bears: Helping Hearts is now available on DVD!!! 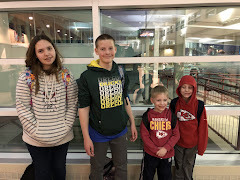 Music Monday: Ugly Kid Joe "Cats in the Cradle"
What in the World, L? How many shopping days until next Christmas? Music Monday: One Republic "All the Right Moves"